Isolate It! 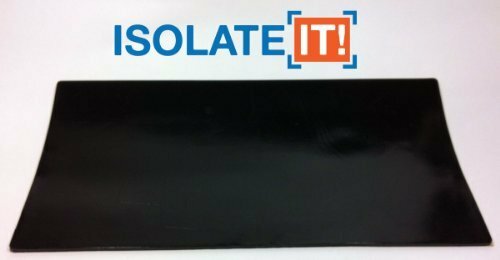 : Sorbothane Acoustic & Vibration Damping Film 60 Duro (0.10 x 6 x 12in) by Isolate It! at In The National Interest. MPN: 0206109-60. Hurry! Limited time offer. Offer valid only while supplies last. Isolate It! Sorbothane acoustic and vibration isolation thin films are versatile anti-vibration pads that can be used on many different applications. Isolate It! Sorbothane acoustic and vibration isolation thin films are versatile anti-vibration pads that can be used on many different applications. The unique Sorbothane ultra-soft urethane is a durable, resilient, polymer that provides outstanding vibration isolation and non-skid properties. Sorbothane isolators help absorb impact and noise and have excellent resistance to aging; they will not harden or crack over time. They feature a smooth, clean, black urethane surface. Use them on any audio and electronic equipment to prevent skipping and interference. Caution: This product contains plasticizer which may cause minor discoloration to wood, plastic, composite and other materials following prolonged contact. View More In Shoulder Washers. If you have any questions about this product by Isolate It!, contact us by completing and submitting the form below. If you are looking for a specif part number, please include it with your message.